While still waiting to get a working battery for my Honey Bee V2 I continue to mess around with the Syma S107 in the office. It's a great distraction: if I get frustrated with code I just go into a quiet machine room with my toy helicopter and mess around for five minutes. Invariably, when I get back to the desk the problem I was trying to escape doesn't seem nearly as daunting. Perhaps my employer should provide all its software engineers with this toy to make them more productive. Anyway, I wanted to make the S107 go a little faster. I tried what some have suggested, removing the weights from the ends of the flybar but it became too unstable. Instead, I removed the tail do-dads, boom support struts, and rear skid legs. You loose a little weight and strength but it can still survive a crash pretty well. Because the center of gravity has moved forward slightly the helicopter will now move forward at center stick and it takes quite a bit of rear stick just to hover. So, at the cost of a little stability you get a lot faster forward momentum. The only other hack I've done to the S107 is remove the spring that held the throttle at 0%. Now you can fly it more like a proper RC helicopter with two fingers holding each stick and the throttle not fighting against you all the time. If you do this just remember that you must cut the throttle before you crash otherwise you will do more damage to your helicopter (again, like the bigger, hobby helicopters) which is probably the reason the spring is there in the first place. Try some other models if you want to make RC Helicopters fly faster and high range. There are several models available online and you can check the specification according to your requirement. 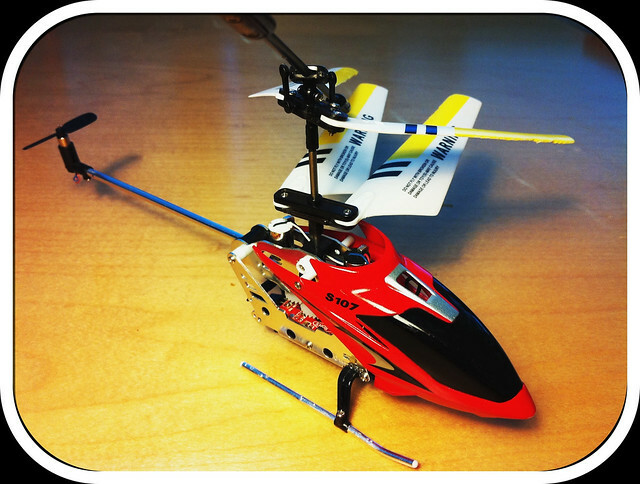 It will help you and there is no need to remove the parts of your previous rc helicopter . Here are multiple reasons that the drone becomes quite typical in know days and nights, because of drone traveling and camera recording efficiency the drone end up being the 1st selection of very early age people and the kids also enjoy it and soar the drone, which means this best drone to buy could possibly be the best for everybody.